Just because you have a smaller model outdoor shelter doesn't mean you have to sacrifice any of the benefits that canopy accessories can offer. 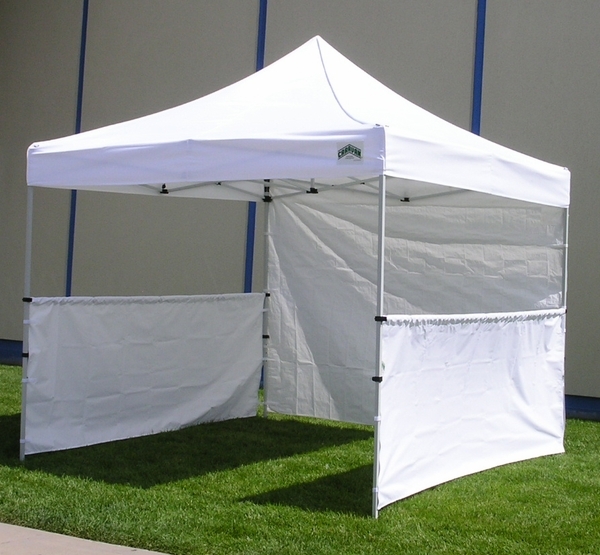 If you regularly attend craft fairs, tailgates, marketing expos, or other events you may need a variety of accessories to set your outdoor area apart from the crowd. One of the best ways to accomplish that is to try out this Caravan 5-Foot Professional Side Rail with Hardware. This simple, easy-to-apply shelter addition makes it easy to customize your shelter no matter what situation you're in. A 5-foot siderail attaches to any Caravan canopy with at least one 5-foot wall. It attaches quickly and easily, and the rail is constructed of professional grade 500 denier polyester, so you don't have any difference in the quality of your tent top and the side rail. Safety concerns aren't a problem since, like the top, this rail is fire and water-resistant. A siderail can offer owners other benefits, too. The deterrent provided towards people walking through your tent space has already been discussed, but there are also benefits like creating a space that is attractive for specialized outdoor uses. Occasions like marketing expos, trade shows, craft fairs, and similar events often necessitate specialized equipment, and in many of those situations this 43 in. high side rail is the perfect solution. Whether it's to satisfy your sense of style or to address some practical concerns, Caravan 5-Foot Professional Side Rail with Hardware can be a useful addition. This is especially true if you attend some of the events listed earlier that can require a little bit of unique equipment from time to time. So take a little time this outdoor season to figure out exactly what your needs are and, in some cases, you may find that this siderail is the product that best fits your purposes.